The innate immune system is the first line of defense in response to nonself and danger signals from microbial invasion or tissue injury. It is increasingly recognized that each organ uses unique sets of cells and molecules that orchestrate regional innate immunity. The cells that execute the task of innate immunity are many and consist of not only “professional” immune cells but also nonimmune cells, such as renal epithelial cells. Despite a high level of sophistication, deregulated innate immunity is common and contributes to a wide range of renal diseases, such as sepsis-induced kidney injury, GN, and allograft dysfunction. This review discusses how the innate immune system recognizes and responds to nonself and danger signals. In particular, the roles of renal epithelial cells that make them an integral part of the innate immune apparatus of the kidney are highlighted. The innate immune system is the first line of defense against infection (nonself) or tissue injury (damaged self). The cells and molecules of innate immunity are rapidly activated by encounter with microbes or other “danger signals.” The rapidity of the response is essential because of the fast doubling time of typical bacteria. The innate immune system was once perceived as a crude stopgap until the adaptive immune system activates. It is now understood that innate immunity is a highly sophisticated sentinel system vital to maintaining a healthy tissue microenvironment. In fact, the innate immune system first appeared 750 million years ago and has been remarkably conserved throughout the evolutionary tree of life. To put it into perspective, the rodent and human lineage separated from a common ancestor only 80 million years ago (1–3). The components of the innate immune system are many. They include soluble recognition molecules, such as natural antibodies, pentraxins (e.g., C-reactive protein), and the complement system. Cellular components of the innate immune system consist of phagocytic cells (e.g., macrophages), antigen presenting cells (e.g., dendritic cells), and killing cells (e.g., natural killer cells). In addition, subsets of T and B cells have limited antigen receptor diversity and also participate in innate immunity (e.g., invariant natural killer T cells, γδ T cells, B-1 B cells). Finally, epithelial cells are an integral component of innate immunity and function as physical barriers, producers of cytokines and chemokines and have the ability to actually recognize and process danger signals. Although epithelial cells are generally viewed as unofficial members of the professional immune system, they constitute the vast majority of cells in a given organ, and, therefore, their relative contribution to immunity can be substantial. In this review, we first discuss how the innate immune system recognizes and responds to danger signals in general. We then shift the focus to the kidney. In particular, we highlight the roles of renal epithelial cells as important trouble sensors and possibly trouble makers. This epithelial cell–centric view, which is an important concept in the danger model, was first proposed by Polly Matzinger (4–6). The danger model says that it is a tissue that controls whether you turn on an immune response, by sending alarm signals. It is also a tissue that induces tolerance by allowing its antigens to be presented without alarm signals. Perhaps, therefore, it could also be the tissue that determines the class of immunity. Bruce Beutler's seminal discovery of the endotoxin receptor, Toll-like receptor (TLR) 4 (TLR4), in 1998 revolutionized our understanding of innate immunity (7). 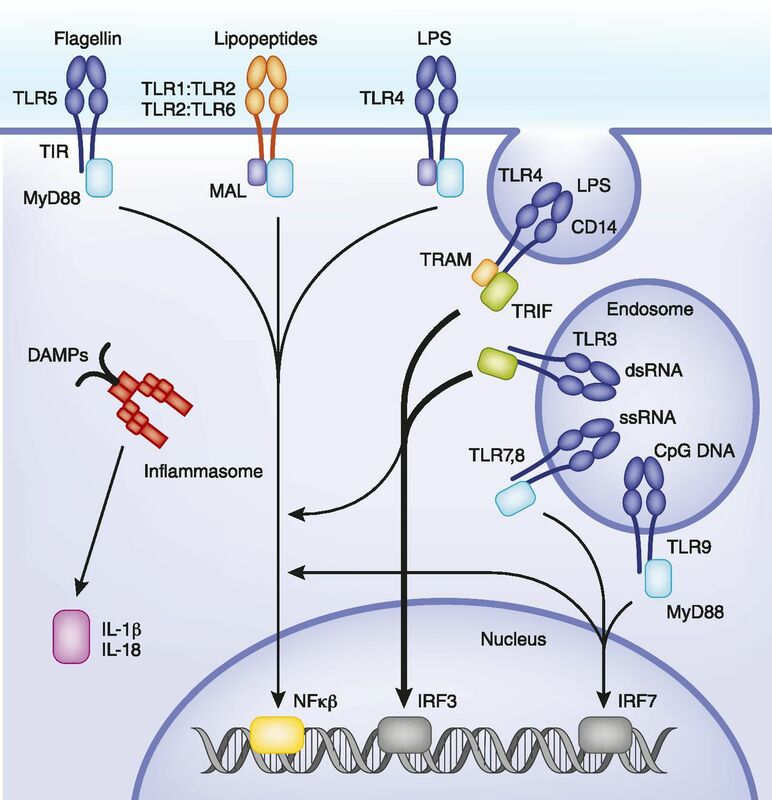 We now know that most mammalian species have 10–13 types of TLRs and that each receptor recognizes specific ligands and induces a wide array of inflammatory cascades (8) (Figure 1). TLRs are expressed most heavily in myeloid-lineage cells but are also found in other cell types, including renal epithelial cells (9–13). We discuss the roles of TLRs in renal epithelial cells later in this review. Location and signaling pathways of pattern recognition receptors. Toll-like receptors (TLRs) are membrane-bound glycoproteins and consist of a functional homomer (e.g., TLR4) or heteromer (e.g., Toll/IL-1 receptor [TLR] 1:TLR2). TLRs have characteristic ligand-binding motifs (leucine-rich repeats and cysteine-rich repeats) and cytoplasmic signaling domains (TIR homology domains). Note the differential localization of TLRs. Upon activation of TLRs, the TIR domain engages the adaptor molecule MyD88, with the exception of TLR3, which exclusively signals through TRIF. The TIR domain of TLR4 can engage both MyD88 and TRIF pathways. The coreceptor CD14 facilitates internalization of TLR4 and subsequently activates TRIF signaling pathway. The best-characterized cytosolic receptor is the NLRP3 inflammasome complex. The mature inflammasome activates caspase-1, which in turn generates IL-1β and IL-18. These cytokines induce various proinflammatory pathways, including programmed inflammatory cell death (pyroptosis). CpG DNA, unmethylated cytosine-phosphate-guanine DNA; DAMPs, damage-associated molecular patterns; dsRNA, double-stranded RNA; IRF, IFN regulatory factor; MAL, MyD88-adapter–like; MyD88, myeloid differentiation primary response gene 88; NLRP3, NOD-like receptor family, pyrin-domain-containing 3; ssRNA, single-stranded RNA; TRAM, Toll-like receptor 4 adapter protein; TRIF, TIR domain–containing adapter-inducing INF-β. Structurally, all TLRs are membrane-bound glycoproteins and have characteristic ligand-binding motifs (leucine-rich repeats and cysteine-rich repeats) and cytoplasmic signaling domains (Toll/IL-1 receptor [TIR] homology domains) (8). TIR domains are also found in cytokines, such as IL-1 and IL-18, and therefore share similar signaling pathways leading to inflammation. Upon activation, TIR domains engage the adaptor molecules myeloid differentiation primary response gene 88 (MyD88) or TIR domain–containing adapter-inducing INF-β (TRIF). TLR3 signals exclusively through TRIF while other TLRs signal primarily through MyD88. TLR4 is unique in that it can activate both MyD88 and TRIF pathways (Figure 1). In addition to the membrane-bound TLRs, many cytosolic receptors have also been discovered over the past decade (14). The two major classes of the cytoplasmic receptors are Nucleotide-binding oligomerization domain-like receptors (NOD-like receptors, NLR) and retinoic acid-inducible gene-I-like receptors (RIG-like receptors, RLR). In particular, the cytoplasmic signaling complexes, commonly called inflammasomes, are under intense investigation (15–19). These membrane-bound and cytosolic receptors are collectively called pattern recognition receptors (PRRs) because they recognize specific structural patterns. The specificity is remarkable, reminiscent of adaptive immunity. However, the specificity of innate immunity differs from that of adaptive immunity in several aspects (Table 1) (2,20). The innate immune system recognizes structures shared by classes of microbes, whereas adaptive immunity recognizes individual details of microbes (antigens). The microbial structures recognized by innate immunity, called pathogen-associated molecular patterns (PAMPs), are characteristic of microbes but not common to the host. For example, TLR9 recognizes hypomethylated cytosine-guanine DNA sequences, which are present in microbial genomes but are uncommon or masked in mammals. In contrast, antigens recognized by adaptive immunity may not be unique to microbes. Another difference is that structures recognized by the innate immune system are often essential for survival of the microbes (e.g., LPS, the essential component of the Gram-negative bacterial cell wall). Conversely, antigens recognized by adaptive immunity are not necessarily essential for survival. In fact, certain pathogenic microbes can mutate antigens to evade host adaptive immune defense without compromising their own survival. Finally, because PRRs are encoded in the germline (as opposed to somatic recombination in adaptive immunity), the number of molecular patterns that the innate immune system can recognize is limited. Nevertheless, it is estimated that innate immunity can recognize up to 103 molecular patterns (the adaptive immune system is estimated to recognize 107 or more antigens) (20,21). One notable feature of pattern recognition receptors is their strategic location in various cellular compartments, allowing them to sense distinctive PAMPs and trigger specific downstream signaling cascades (22,23). For instance, host nucleotides are not normally present in endosomes, whereas microbial nucleotides can be found in endosomes following phagocytosis. Therefore, endosomal distribution of TLR3, 7, 8, and 9 (receptors of nucleotides) will allow the host to respond to microbial nucleotides but not to host nucleotides (Figure 1). The fact that pattern recognition receptors recognize structures shared by broad classes of microbes poses a dilemma. How does the host discern pathogenic microbes from nonpathogenic microbes? This is not trivial; the number of bacteria we host amounts to 1014, 10 times more than all the human cells in one individual. Most of these bacteria are harmless or even beneficial (commensals). However, they are also equipped with the same microbial structures found in pathogenic strains, such as LPS. How the innate immune system distinguishes the good from the bad remains an intense area of research as it relates to broad clinical problems, such as allergy and chronic inflammatory diseases. Medzhitov, who cloned the human TLR4, figuratively describes it: “Detecting a person in a building does not necessarily mean they are an intruder, since not all people are intruders. But if someone comes into the building through a window at night, then that might indicate the person is a burglar” (24). So, perhaps not surprisingly, PRRs expressed on sentinels such as macrophages can also recognize “damaged self” and trigger inflammation. Typically, sentinels see “damaged self” by sensing endogenous soluble molecules that are confined within the cell under normal state but are released after injury. The prototypes of the endogenous molecules include extracellular ATP, high-mobility group box protein 1, and heat shock protein, collectively called damage-associated molecular patterns (DAMPs) (25). DAMPs can induce strong inflammation and the net clinical outcomes are often indistinguishable from those of PAMP-induced inflammation. Indeed, sterile-tissue injury, such as blunt trauma, results in a “genomic storm” that highly resembles endotoxin-induced transcriptome changes (26). DAMPs are also highly relevant in the settings of renal ischemia-reperfusion and allograft injury (27). Of note, some DAMPs do not directly bind to their PRRs. Instead, these DAMPs are believed to induce small structural changes in other molecules that activate the receptor and its downstream pathway (28). Upon activation, PRRs can induce three major types of responses: (1) phagocytosis, (2) inflammation, and (3) maturation of antigen-presenting cells (e.g., macrophages and dendritic cells), which leads to activation of the adaptive immune system (Figure 2) (29). The cellular and molecular details of these responses are extensively covered in general immunology reviews (8,30–32). Notably, the maturation of antigen-presenting cells provides an important link between the innate immunity and adaptive immunity. It is important here to point out that PAMPs are not necessarily the final antigen being presented by antigen-presenting cells. PAMPs do activate their cognate PRRs and initiate phagocytosis, but the final modified and presented antigen is likely another constituent of the phagocytized microbe. The biology of antigen capture and presentation has attracted and will continue to captivate scientists because it encompasses the most fundamental question of immunology: self/nonself discrimination (29). Innate immune responses encountered by microbes. Microbes are detected by pattern recognition receptors (PRRs) expressed in innate immune cells, such as macrophages.The detection of microbes by the PRRs rapidly activates signaling cascades and generates inflammatory responses. Microbial encounter also leads to maturation of macrophages and dendritic cells into antigen presenting cells. PAMP, pathogen-associated molecular pattern; TCR, T-cell receptor. Phagocytosis is a platform for activation of many PRRs and often a prerequisite for activation of inflammatory signaling cascades. For example, CD36, a scavenger receptor expressed on phagocytic cells, recognizes microbial diacylglycerides and prompts phagocytosis. This in turn leads to proinflammatory responses. Ideally, the inflammatory responses should confine infection and improve the host outcome. Unfortunately, excessive inflammation often results in collateral tissue damage. Indeed, it has been reported that the inhibition of CD36 reduces inflammation and even improves the survival rates in an animal model of sepsis despite the impaired scavenging function (33). Clinically, the inflammatory cytokine storm results in vasodilation, refractory hypotension, and ultimately death. At the cellular tissue level, various degrees of oxidative stress, cell cycle arrest, and damaged organelles (e.g., mitochondria) can be observed in various organs, including the kidney (34–38). To mitigate the cytokine storm, many clinical trials have sought to block PRRs in patients with severe infection. The most illustrative example is the inhibition of TLR4. Eritoran, an inhibitor of TLR4, was thought to be effective in reducing sepsis-induced mortality by blocking inflammation. Contrary to expectations, multiple clinical trials have failed to demonstrate positive outcomes with TLR4 inhibition (39–41). To some, the failure of TLR4 inhibition was not unexpected. It has long been known that TLR4 mutant mice are resistant to endotoxin yet are highly susceptible to gram-negative bacterial infection because they cannot sense or react to actual bacterial invasion (7). This raises an important clinical question: the balance between elimination of microbes and minimizing inflammation. Could we find a compromise whereby killing of microbes, although not perfect, may involve minimal collateral tissue damage? Emerging data suggest that it is possible for the host to do so (42,43). The interested reader is referred to Jamieson and colleagues' recent article, which also points to the importance of tissue repair capability (44). Renal epithelial cells are surrounded by a dense network of macrophages and dendritic cells, collectively called mononuclear phagocytes. These mononuclear phagocytes are thought to play an important role in maintaining the integrity of tissue microenvironments. In fact, mononuclear phagocytes are abundantly present even in early embryonic kidneys (45). Mononuclear phagocytes have markedly diverse functions: from traditional phagocytic function and inflammation to versatile, trophic roles. We do not go into the details of renal mononuclear phagocytes because this is covered by Kurts et al. in this CJASN Immunology Series. Instead, here we focus on the often underappreciated roles of renal epithelial cells in sensing danger signals. Many PRRs, including TLRs, are expressed in renal epithelial cells (46–54). The precise distribution of tubular TLRs remains somewhat uncertain. This is in part due to the inherent complexity of the kidney architecture. One needs to combine technically intricate microdissection, in situ hybridization, and immunostaining to adequately characterize TLR expression and distribution among various renal cell populations. In this regard, immunostaining remains challenging because of lack of firm antibodies in this class. Moreover, TLRs are such potent receptors that the expression levels are typically low at the levels of mRNA and protein. In monocytes, it is estimated that TLR4 is present at 1300 molecules per cell, whereas CD14, the coreceptor of TLR4, is expressed at 115,000 molecules (55). In nonmyeloid cells, TLR4 expression is likely much lower. Nevertheless, because the total number of epithelial cells far exceeds that of immune cells, tubular TLRs are an important part of renal innate immunity. In support of this, Wu et al. performed a classic experiment (56). They examined the effect of renal ischemia-reperfusion injury in bone-marrow chimeric mice between TLR4 knockout and wild-type animals. Chimeric mice lacking intrinsic renal TLR4 had significantly less tubular damage and azotemia than mice lacking hematopoietic TLR4, indicating that TLR4 in the kidney is instrumental in mediating tubular damage. Using a model of endotoxemia, we also demonstrated that endotoxin-induced tubular injury has an absolute requirement for tubular TLR4 (57). Conversely, TLR4-expressing hematopoietic cells were not essential or sufficient to cause tubular toxicity. Zhang et al. and Pulskens et al. also showed the importance of intrinsic renal TLR4 after cisplatin nephrotoxicity and ischemic injury, respectively (58,59). Similarly, Leemans et al. examined bone-marrow chimeric mice between TLR2 knockout and wild-type mice and found that intrinsic renal TLR2 has a central role in the unfolding of the injury process (60). In summary, collective evidence strongly indicates that epithelial TLRs contribute to tissue injury and inflammation in response to danger signals. In human kidney transplantation, Kruger et al. reported differences in TLR4 expression in kidney tubules from deceased versus live donors (61). The same authors also identified loss-of-function single-nucleotide polymorphisms, Asp299Gly and Thr399Ile, in TLR4 genotype in a large cohort of donors (62,63). These kidneys with a TLR4 loss-of-function allele had a higher rate of immediate graft function. Although hematopoietic TLR4 likely contributed to inflammation to some extent, this study highlights the significance of renal tubular TLR4 in graft function. Detailed reviews on the role of TLRs in renal allograft can be found elsewhere (64,65). From a methodologic standpoint, a limitation of these transplant and bone-marrow chimera approaches is that results could be confounded by other nonimmune, nontubular cell types, such as endothelium. Therefore, studying animals with cell type–specific gene manipulation may further illuminate the roles of TLRs in each cell type. In this regard, Deng et al. conducted an interesting study in the liver in which they deleted TLR4 from hepatocytes or myeloid cells. They found that hepatocyte TLR4 plays an important role in clearing endotoxin and limiting sepsis-induced inflammation and organ injury (66). A model of endotoxin-induced tubular injury. 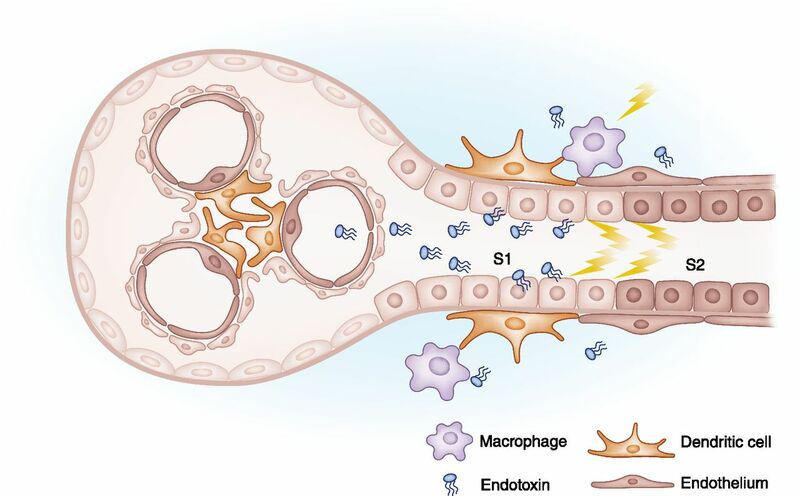 Endotoxin, released from bacteria in various molecular sizes, can be filtered through nephrons and internalized by S1 proximal tubules through a Toll-like receptor 4–dependent mechanism. The interaction between endotoxin and S1 can result in oxidative stress and injury in downstream tubular segments. Yellow lightning bolts represent signaling molecules released by macrophages or S1 cells after interacting with endotoxin. Besides generating inflammation, phagocytosis is another hallmark of mononuclear phagocytes. Ichimura et al. demonstrated that kidney injury molecule-1, a proximal tubule injury marker, is a phosphatidylserine receptor and as such can function as a scavenger receptor (68). Therefore, during tubular injury, proximal tubular cells are transformed into “semiprofessional phagocytes” (68). This further illustrates the principle of shared functions between epithelial cells and professional innate immunity. Furthermore, MHC II and costimulatory proteins can be expressed on proximal tubules after various stimuli, and some data even suggest that proximal tubules could present antigens to T cells (69–76). Distal tubules also express PRRs and participate in local immune responses (77–80). One important difference remains between epithelial cells and professional innate immunity: mobility. Renal epithelial cells do not typically translocate. Therefore, epithelial cells alone will not be able to accomplish higher levels of immune activities (such as remote information transfer) unless they are supported by immune cells. Ultimately, epithelial cells and immune cells are both essential in shaping renal immunity. With advances in multiplexed, single-cell technologies and ever-increasing genetic tools (81–83), we anticipate that many exciting discoveries will be made at the cellular and molecular levels and will elucidate the mechanisms of epithelial cell–immune cell communication. We have discussed recent advances in our understanding of renal innate immunity with special emphasis on renal epithelial cells. However, this epithelial cell–centric view should not preclude the contribution of other nonimmune cells to overall renal innate immunity. For example, there is a wealth of literature suggesting that certain types of glomerular injury are mediated by PRRs expressed on podocytes (84). It is proposed that proinflammatory cytokines generated from glomeruli could spread inflammation along the tubules through peritubular capillaries (85). Heightened PRR activation in the endothelium is another important source of inflammation (86,87), while properly activated endothelium is critical for mobilizing immune cells and clearing microbes (88). We also point out that because of the sentinel nature of innate immunity, studies have primarily focused on acute pathologic changes rather than long-term consequences of PRR activation, such as its role in fibrosis (89–91). From a clinical perspective, several kidney diseases have been linked to deregulated innate immunity and inflammation (Table 2) (92–94). For example, Mulay et al. demonstrated that tubular injury from calcium oxalate crystals is triggered by NLRP3 inflammasome in renal mononuclear phagocytes (95). In both human IgA nephropathy and an animal model of IgA nephropathy, recent genome-wide association studies identified susceptibility polymorphisms involved in innate immunity and inflammation (96,97). In fact, a more recent investigation of gene expression variants by expression quantitative trait loci analysis revealed a high degree of overlap between SNPs important in regulation of innate immunity and those associated with renal disease phenotypes (98). We address now the more complex issue about the transition from innate to adaptive immunity. Indeed, a full innate immune response is expected to culminate in the maturation of antigen-presenting cells and the triggering of adaptive immunity. An important question therefore relates to the equivalence of DAMPs and PAMPs in that regard. That is, are DAMPs capable of eliciting a full innate immune response beyond causing local inflammation through their interactions with PRRs? A recent study by Oberbarnscheidt et al. suggests that this might not be the case. Indeed, these authors showed that DAMPs released from ischemic injury to syngeneic grafts were not sufficient to cause full antigen-presenting cell maturation and adaptive immunity. Conversely, an allogeneic graft, similarly subjected to ischemic injury, did trigger a full innate immune response and activated adaptive immunity. This suggested that, beyond DAMPs, innate immune cells could also be sensing allogeneic nonself (allorecognition), a property previously thought to exist only in adaptive immune cells. The authors proposed that it was the recognition of allogeneic nonself rather than DAMPs that linked innate immunity to adaptive immunity and thus offered a unification of alloimmunity with the Janeway model of microbial immunity. This latter states that recognition of nonself is at the heart of all immune responses (99). Innate immunity is a highly sophisticated system regulated through PRRs. It is remarkable how far the landscape of innate immunity has changed since Charles Janeway predicted the existence of PRRs in 1989 (100). The discovery of TLRs and other PRRs has also transformed our understanding of the kidney in health and disease. In this review, we have highlighted the shared functions between renal epithelial cells and professional immune cells. We discussed both the deleterious and beneficial aspects of renal epithelial TLRs. Furthermore, TLRs expressed in other nonimmune cells are also an integral component of the regional immunity. As exemplified by the recent failures of TLR4 inhibitor clinical trials, the path to tame the highly sophisticated innate immune system remains challenging. Perhaps progress is also needed in understanding and modifying the “tissue response” to the immune system. In that regard, the phenomenon of endotoxin tolerance following preconditioning might offer insights into novel mechanisms of protective adaptation. Indeed, it is now recognized that preconditioning results in tissue protection along with a preserved capacity to fight and contain infections. The mechanisms involved in endotoxin preconditioning could in turn be targeted selectively or globally to enhance tissue protection in the face of an exaggerated innate immune response (42–44,101). These are indeed exciting times for the renal research community. This work was supported by National Institutes of Health (NIH) grant R01-DK080067, O’Brien Center grant P30-DK079312 (NIH), and Dialysis Clinics Inc. grant to P.C.D.